I was so thrilled when my sweet friend, Heather, of the popular SprinkleBakes blog (and now the popular SprinkleBakes book! ), asked me if I wanted to have one of her books for a giveaway! Of course, I said "Yes!" SprinkleBakes is not your average cookbook. Its subtitle, "Dessert Recipes to Inspire Your Inner Artist" is definitely a clue to what's in store. It's full of edible art, eye-candy, a wide variety of amazing recipes, and encouragement on developing your own artistic style for creating in the kitchen. It's a must-have! 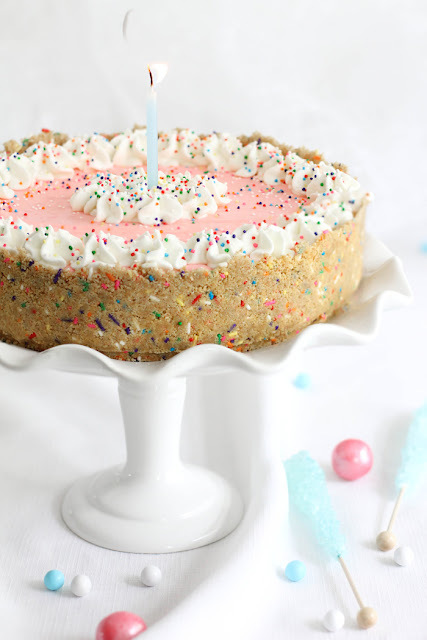 No Bake Strawberry Milk Cheesecake from Heather's blog, SprinkleBakes. Sprinkles in the crust?!? How brilliant is that? :) I love it! SprinkleBakes is one of the first sites I "discovered" way back when:) What a precious gem in the treasure trove of blogs it is! The "icing on the cake" is that Heather is genuine, creative and sweet, just like everything featured on her blog, and now in her book. Yesterday I whipped up some blackberry curd (just berries, a bit of sugar, egg yolks and butter) using a recipe from the SprinkleBakes book and it is SO good! I just got over the stomach flu and it was wonderful to have my appetite back. I hadn't eaten anything but a few crackers for the prior 36 hours, and I think I could have eaten this blackberry curd just like pudding:) Though I did have a spoonful, I'm saving it for some scones I am going to make. I love the beautiful color of this blackberry curd. I've made lemon curd a couple of times, but never ventured to any other variety. I see all sorts of curds coming from my kitchen this year, and I'm anxious to try more of the recipes in this exceptional cookbook! Did I mention that Heather signed the book for this giveaway? Yep, she did! *This giveaway will end on Sunday, May 20th, 5:00 p.m. Pacific Standard Time. *The lucky winner will be chosen via random.org. and will have 48 hours to respond before a second winner is chosen. Please leave your email address within your comment so that I may reach you. This giveaway is open to everyone! Ice cream. Any kind. Any where. Ice cream. I love your cake stand ;-) Cake looks very colourful and festive. Anything with peanut butter and chocolate!!!!!!!!!!!!!!!!!!!!!!!!!! This book has been on my "TO BUY" list - thanks for the great giveaway. That blackberry curd looks out of this world, how yummy for scones at tea time! Chocolate cake with peanut butter frosting! Great giveaway! Congrats for hitting 3,000 on FB! I am shocked you haven't reached in the ten thousands...your goodies are amazing! I have to pick just one dessert?! Then I guess it'd better be chocolate cake. So hard to pick just one dessert! Cheesecake, I think, or maybe......chocolate molten cakes, or...........!! I'm a fan of most desserts, it's so hard to pick just one...I guess I would have to say apple crisp a la mode! My favorite dessert is Tropical Carrot Cake with Cream Cheese Frosting. short bread! nothing like salty buttery shortbread. so simple, but so amazing! Angel Pie. A meringue crust with a lemon filling and tons of whipped cream on top! Cupcakes! Preferably with sprinkles and a big heap of frosting!! I am all about pies or cobblers, particularly cherry. Yum! Maple cupcakes with maple buttercream. now that im pregnant, my favorite things is probably cookies! especially soft, chewy chocolate chips ones! Fave dessert - cookie dough whoopie pies! Oh goodness. How to choose. Generally anything chocolate. But I'll say chocolate mousse pie. With whipped cream. Correction: with BOURBON whipped cream. YES! Anything that has chocolate! Love chocolate! :-) I'd love to have that book! Cake. Okay, really just the frosting, but I like cake. If I could only choose one, I'd have to go with the Hungarian Dobos torta...those decedent layers of chocolate buttercream and golden cake get me every time. Hands down. OMG I lOOOOOOOOOOOVE that cake. This is the cookbook for me!! So much fun. I think anything with chocolate is my favourite dessert. Epecially layers of chocolate. Anything chocolaty will work for me! I've made the Chocolate Chip Cookie Dough Devil's Food Cake Cheesecake and it was AMAZING! The next one I'm going to try is the Chocolate-Honey Cake for my daughter's 25th birthday (which was in April, but I'll finally see her later this month). So excited to find your blog! I'm not so great at choosing favorite (mostly because I want everything all at once! ), buuuuut I'd have to say ice cream is my favorite dessert -- all flavors! Yay! I'm so excited for this book. My favorite dessert....Oh dear I can't decide, but I usually get really excited for creme brulee or tiramisu, or anything with caramel. Chocolate Cake with peanut butter frosting! I really don't have a favourite dessert, but I would prefer a cake or tart with seasonal fruits most of the time than anything else. My favourite will always be baked vanilla cheesecake with a raspberry coulis. However, I am a sucker for my best friends mums Banoffee Pie, yummmm! Chocolate pudding cake is a traditional in my family and one of my all-time favorite foods! What my family calls "tarte a la bouille" is one of my favorite desserts. I was in Louisiana this weekend and was fed some made by the incomparable Carolyn Primeaux...I would love to win a copy of Heather's book. Pineapple upside down cake is my all-time favorite dessert. Vanilla cupcakes -- with lots of sprinkles, natch! So hard to pick just one but anything chocolate and peanut butter is usually my first choice ! Cheesecake has always been my favorite dessert. Your blackberry curd looks fab! Favorite of all favorites? A warm, thick, gooey chocolate chip cookie under some yummy ice-cream with hot fudge sauce! If I have to choose just one dessert for my favorite, then I have to choose ice cream. I love it and could eat it every day. I love lemon Meringue pie, yummy!! I'm so glad Heather put a book out! I wonder would she consider creating an app?! It would be a fantastic interactive source of fun for all bakers out there! Blackberry curd...just the tastes the name conjures up makes me want to use hundreds of ways...cupcakes, mousses, cake filling, etc. I could go on! S'mores - by the campfire of course! But...my favorite dessert of all time is my mother's version of strawberry shortcake...mile high luscious c ake, an endless amount of homemade whipped cream (I'm getting hungry as we speak) and sweet succulent strawberries! Yummmm! I love cheesecake. I think the blackberry curd would be a great topping on the cheesecake. I loveee anything with peanut butter and chocolate or a really crunchy creme brûlée! My favorite is cheesecake. I think I could eat cheesecake everyday and not be sick of it. Anything with a chocolate mint combo. Yum... I think I have to go make dessert now! I have a strange compulsion to buy/eat it any time I see it. Favorite dessert is cheesecake but I truly love this lemon cheesecake with a blueberry compote that I found in the food network cookbook. My favorite dessert is chocolate cheesecake...and my mom's blueberry pie. Pineapple Upside Down Cake - I have a recipe I have used for 40 years. It makes my mouth water just thinking about it! My favorite dessert: definitly Key lime pie!!!! I would have never tought of blackberries curd, so beautiful and a great idea! I don't even know where to start... Cheesecake... so hard to pick just one! My favorite dessert is creme brulee... however, there are so many delicious SprinkleBakes recipes to try that it may change soon! My email does not show up for some reason, so if I am lucky enough to win I can be reached at courtney.bryan@ucdenver.edu. Thanks! My favorite dessert is anything with nutella! I need to get that book - blackberry curd is on my list! Since summer has finally started showing itself I'd have to say strawberry cream cheese dessert..Its cool and creamy and a nice thick layer of strawberries..No one complains when this hits the table.. Currently my favorite dessert is anything caramel and french macarons! My favorite dessert is carrot cake! My favorite dessert is probably molten chocolate cake...but really, any kind of chocolate will do. Except white chocolate, that stuff is an abomination. Anything involving peanut butter and chocolate!! YUM!!! Thanks for the great giveaway, I love Heather's blog. My absolute favorite dessert is Coconut Layer Cake, using a recipe my sister found of Martha Stewart's. I still remember the first bite I took of it--so heavenly! I think some treats are so yummy they have to be reserved for special occasions, if that makes sense! So I'm going to make it next for my birthday, lol! This book looks SO GOOD. Very fun, and the fact that it is signed is so cool!! Love her Coca-cola and peanut cupcakes. A new favorite! I love classic baked cheesecake with butterscotch on top! Entering the raffle most eagerly for this precious book!! Wishing to win that awesome and creative book. I love of all kind of desserts, but whoopie pies with marhmallow fluff are deliciousss! It's hard to say just one dessert! I guess my all time favorite thing to get my hands on is a perfect yellow cake with fluffy chocolate buttercream frosting. I love amything with caramel! Man oh man, I'm always the worst at these 'favorite questions', I can never decide! However if I had to pick one item left in the world to eat it would have to be basic creamy rich sweet softly frozen vanilla ice cream! I love that it can be tweaked so quickly to everyone tastes and I can have it in many different ways in one setting. BTW I love that you made a blk berry curd. I've made a lemon curd a couple of times too, but haven't branched out in the fruits yet. Thanks for this. first i need to say that strawberry cheescake looks delicious. YUM! but i like a light lemony cupcake. I'm changing ... these days my favorite dessert needs salty or tart. This blackberry curd looks delicious! A white cake with my mom's birthday cake icing. I love Sacher Torte !!! MMM!! Nice giveaway! Cookies 'n cream cheesecake is my all time favorite dessert! My favorite is a chocolate chip cookie! 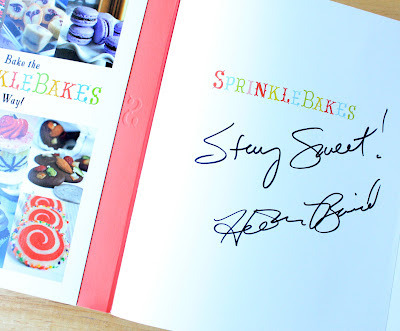 I ♥ my Sprinkle Bakes Book... and it's author!!! The blackberry curd looks amazing, but I've been banned from making scones. Let's just say they held up to weathering and could be used as a new truck bed coating. What else would the curd be good on? Ohhh yes I could do with some more inspiration to bake! Yes please!! I love strawberry rhubarb pie with vanilla ice cream! And also poached pears in puff pastry! Happy 3rd blog anniversary, Sue! Have a great blog year ahead!! Fave dessert is ice cream/gelato/frozen yogurt...creamy goodness! Anything really. But right now I swoon over Macarons! By the way, I'm new to your blog, I love it already!! Brownies...I have become such a shameless "brownie-noser" that as soon as the word chocolate comes along, I'm thinking of how to make it into any kind of brownie...especially cheesecake brownie...yummm...bye...have to go bake brownies now. My favorite dessert is profiteroles. My favorite dessert is Italian cream cake!!! Easily Peach Crisp with Vanilla Blue Bell! Since I no longer eat chocolate I am eating a varity of different sweets now. Have decided what my favorite is yet. I do love cheesecake though. Hard to choose... At the moment, I love anything with meringue and/or white chocolate! Hi my name is Krista. I love love jelly or curd filled donuts!!! Cheesecake, cheesecake, CHEESECAKE! Oh so good :) I could eat it everyday! I love many many desserts, but if I have to pick just one - I would say my momma's homemade banana cake with homemade chocolate fudge frosting! Mmmmmmmm! My favorite dessert is pound cake with just a little chocolate sauce! My favorite dessert is a warm brownie topped with vanilla ice cream. My all time favorite dessert is chocolate cake! My face dessert is tiramisu! I hope I can win this book! Love Heather from Sprinkle Bakes. She is a great inspiration to me! My favorite dessert is a great pudding, butterscotch, tapioca, etc. I love 'em all!! Currently, my favourite dessert is baked french toast, made with banana bread, Baileys, Frangelico and chocolate chips. Served with a side of ice cream, of course. oh man. i can't choose! its either my mom's tres leches cake or campfire smores. both of them just make me feel like a kid again! My favorite dessert is cookies. Also, I really love a cake with buttercream frosting. I enjoy Heather's blog very much and have been reading for about a year. Carrot Cake with Cream Cheese frosting :) yummers! Warm Derby pie with Ice cream on top! My favorite dessert is a slice of cheesecake! Do I have to choose just one? Ok, if I must... it would have to be Gingerbread Cupcakes with Cinnamon Brown Sugar Frosting. But a close second is Carrot Cake with Cream Cheese frosting. Grilled fruit is my favorite dessert. Delicious and good for you too! However, this No Bake Strawberry Milk Cheesecake looks like heaven. Must build the family 1 tonight. Anything with fresh strawberries or anything with thick chocolate ganache! That's two things, but I couldn't decide :). My favorite dessert is cookies and cream ice cream!! I love making and eating a layered carrot cake and vanilla cheesecake with homemade cream cheese frosting! Yum!!! I have to pick ONE??? Okay. Pecan cookies. Key lime pie any day! My favorite dessert? I'd have to go with my grandmother's simple but wonderful ginger snap cookie recipe! Red Velvet Cheesecake! Oh mylanta! Cheesecake or brownies or peanut butter something or ... the list goes on and on! My favorite dessert has to be ice-cream. Specially two types combined, passion fruit flavored and straciattella. By the way, I love your blog :). Anything with chocolate and raspberry I go crazy for. And nothing like a homemade chocolate chip cookie!! Awesome giveaway! My favorite desert is Butterscotch Pie!! Please pick me to win the cookbook!! I've gotta say..anything with s'mores and peanut butter involved. Totally depends on my mood! My favorite desert is raspberry pie (and ice cream... and macarons... and marzipan cake...)! My favorite dessert is warm ricotta cheesecake, yum! Oh Butterscotch is one of my favorites. I am new to your blog and it looks like I have discovered it at just right time. Great giveaway! OMG, me having a favorite dessert? That's like a penguin having a favorite type of sardine! OK, custards/flans, puddings, anything vanilla, anything milk chocolate and anything with blackberry or raspberry. I'd have a field day with that book! Crossing fingers! My favorite dessert is a hot fudge Sunday....mmmm! ooooh-- I just barely made the giveaway deadline!! Yipee :) My favorite dessert, RIGHT NOW.... is Nutter Butter S'mores! I think my favorite dessert is homemade chocolate pudding pie...old-fashioned comfort food, but with more dark chocolate thrown in. I would love a copy of Heather's book! My favorite dessert is pie! It's hard to choose just one, but my favorite dessert would have to be Tiramisu....yum! I have to pick one! hum. . .Ice cream with triple chocolate cookies underneath, or a brownie. . .mmmmmm I love treats!